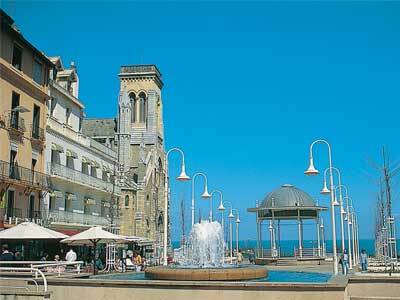 Gillian Thornton headed to Aquitaine to revel in the many summer delights of colourful French Basque Country. Bayonne is my kind of place. Picturesque stone arcades, vibrant cafe culture, busy quayside restaurants, chocolate shops and an annual chocolate festival. Not that it’s an obsession with me, you understand, but you can’t walk far in this elegant town without catching the delicious aroma of chocolate. The first cocoa bean arrived here from South America in the 16th century, shipped into the busy port that grew up around the junction of the Adour and Nive rivers, just a few miles inland from the Atlantic coast. Bayonne is also the unofficial capital of French Basque Country – an area that forms the south-west corner of Aquitaine, where many locals speak French in addition to Euskara, the common Basque Country language, and where road signs are bi-lingual. 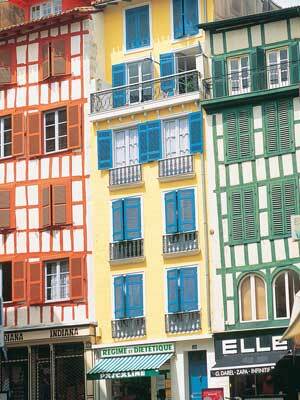 Even on the dullest days, Basque Country is a riot of colour. The red, white and green of the Basque flag are mirrored in the architecture of the whitewashed houses, topped with red tiles and criss-crossed with timbers painted in ‘ox blood’ red or traditional green. But it’s the people of Basque Country who give it such an upbeat feel, celebrating their culture and traditions in a wealth of summer festivals. In fact, they seem to have a festival for just about everything, from traditional music and folk dance to cake, local cheeses and pimentos. There’s even a festival dedicated to espadrilles! Nor are the celebrations confined to the coast. The rumpled interior of Basque Country is dotted with picturesque villages and small towns where you can easily find yourself caught up in local festivities. Pitch up on party day and the ancient streets and squares will be thronged with people. And – just as appealing – once the trestle tables are packed away and the bunting taken down, the pace of life instantly steps down several gears as normality resumes. 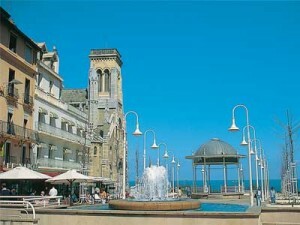 Biarritz was made popular in the mid-19th century by Emperor Napoleon III and his Spanish wife Eugenie. The town is still dotted with the elegant homes of European aristocracy and boasts a broad selection of upmarket shops and restaurants. Yet it’s anything but a historical showpiece. 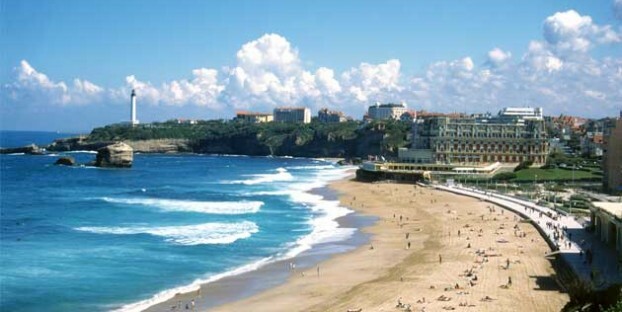 Broad beaches, lively surf culture and impressive sporting heritage make Biarritz a great family destination, and two attractions new in 2011 provide something for all ages. One is an exciting development of the long-established Musee de la Mer, the other the all-new Cite de l’Ocean et du Surf. One ticket buys you entry to both. See under Festivities and Attractions. 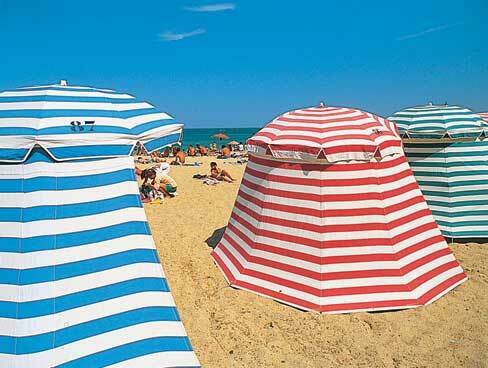 A short drive south of Biarritz brings you to the pretty seaside town of St Jean du Luz and its sheltered sandy beach, tempting boutiques and colourful fishing harbour. Like Biarritz, this was once an important whaling port and still buzzes with life as fishing boats return with catches of sardines, anchovies and tuna. In 1660 ‘Sun King’ Louis IV was married here to the Austrian princess Maria-Teresa. Visit the ornate church of St-Jean-Baptiste. See the pink brick house by the harbour where the bride stayed before her wedding, and the King’s House across the square which now overlooks the tables of the town’s many restaurants. If you’re shopping for authentic Basque Country souvenirs, browse the boutiques for traditional striped table linens, espadrille sandals and jewellery in the shape of the Basque cross – a circular symbol signifying the four elements. 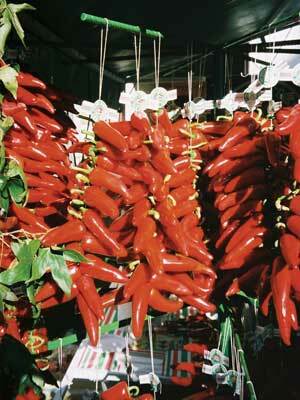 For an authentic flavour of the area, take home a box of delicious macaroons or a string of red Espelette pimentos. Away from the towns and resorts are enchanting communities such as La Bastide-Clairence and Ainhoa, both ranked amongst France’s Most Beautiful Villages. Drop in at Hasparren, nestled in a landscape of steep slopes and deep valleys, and wander round St-Etienne-de-Baigorry, where the names of long-dead property owners are carved in stone above the doorways. 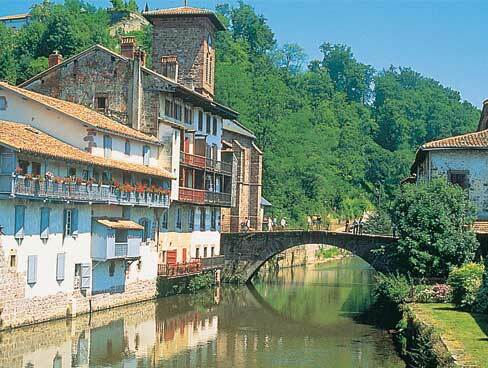 And don’t miss St Jean-Pied-de-Port, an important stopover for pilgrims heading through the Pyrenees to Santiago de Compostela. Climb the steep cobbled street that’s fringed with flower-bedecked houses to the lofty citadel built by Cardinal Richelieu. Walk a section of the city wall and, if you visit on a Thursday morning, browse the outdoor market to buy the essentials for a perfect Basque picnic. For example, you can pick up your favourite charcuterie from Pierre Oteiza, whose town-centre delis dot the area. Stock up on fresh bread and cheese. Buy scrumptious, cream-filled gateau Basque and a bottle of local cider or Irouleguy wine. And to finish? A bar of moreish Bayonne chocolate, of course. What else? 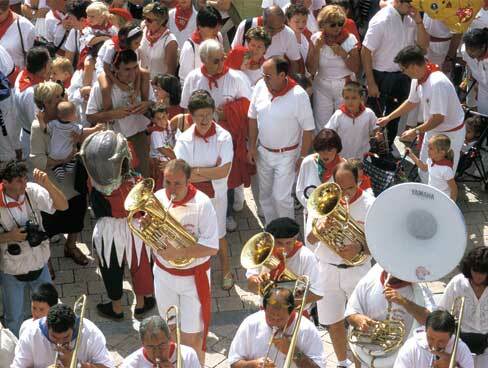 The town’s big 5 day showpiece event, a celebration of Basque culture. Up to 1.5 million people take to the streets, traditionally attired in vibrant red and white. 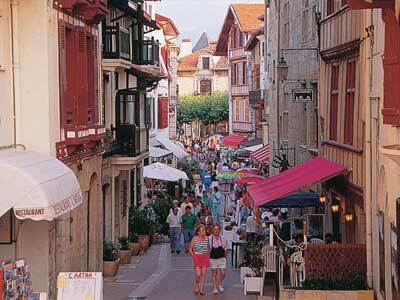 If you miss it, you can still learn a great deal about local traditions and lifestyle at the town’s Basque Museum. The iconic sport of the Pays Basque is pelota – the world’s fastest ball game. It involves hurling a small hard ball (pelote) against a high wall or three, depending on which of the 21 versions is being played. You’ll see frontons (the high back wall of an outside court) in even the smallest town. 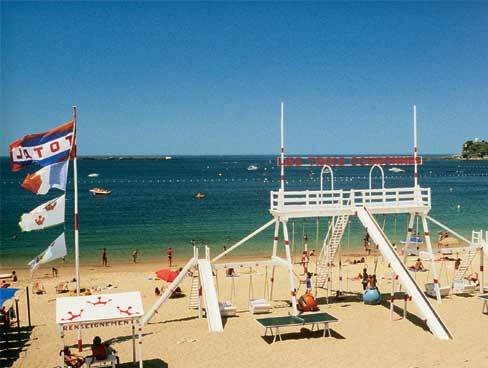 A new attraction close to the Musee de la Mer located at the beaches of Milady and Ilbarritz. Built partly underground with a wave-shaped roof, it combines science, education and fun and is certain to be a big hit with kids. They can discover how oceans appeared on the planet, what happens on the ocean bed and which species live in the depths. Interactive experiences include walking through a giant tube that emulates the sensation of surfing, being on a ship in a storm and discovering myths and legends such as Atlantis and the Bermuda Triangle. Inaugurated in 1933 in a purpose-built Art-Deco building overlooking the offshore statue of the Virgin and linked to the promenade by a footbridge, this showcases the marine life of the Bay of Biscay. From June 2011, with the opening of a new development, the museum has doubled in size and traces the Gulf Stream round Cape Horn to the Pacific. You can see hundreds of different species in themed aquariums, an 11-metre lagoon and well stocked shark tank. All the fun of feeding time for the seals takes place daily at 10.30am and 5pm. Save money by buying a double ticket that also includes Cite de l’Ocean et du Surf. Part of a broader Biarritz Ocean project, these two attractions present differing aspects of the Atlantic waters which have shaped the economy and lifestyle of Aquitaine.